With many of their family members present, responders who saved the life of Osage County resident Wayne White show the Phoenix Awards presented to them Friday. Photo by Bob Connor. In a ceremony Friday morning, Dec. 22, 2017, the EMS Phoenix Award was presented to Osage County Sheriff’s deputies and dispatchers, Osage County EMS personnel, and first responders for saving the life of an Osage County resident in November. The Phoenix Awards recognizes individuals who, through their skills and knowledge, have successfully revived another person known to have been in cardiac arrest. 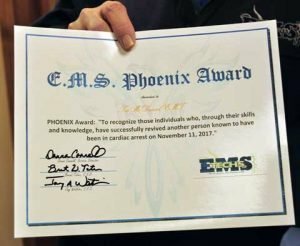 Phoenix Award certificates recognized the responders for successfully reviving a person known to have been in cardiac arrest. Photo by Bob Connor. The awards were presented for the response to a 911 call on Nov. 11, 2017, in rural Scranton, during which local resident Wayne White, 59, had suffered from sudden cardiac arrest. Following the 911 call from his wife, Jan Williams, who had immediately begun CPR assisted by a dispatcher, emergency responders including deputies and volunteers from Osage County Fire District No. 1, Carbondale, continued CPR until Osage County EMS personnel arrived and used a defibrillator to start his heart beating again. White was transported to Stormont Vail Hospital, in Topeka, and has since recovered from the incident. White and his family and many family members of the honored responders were present for the ceremony Friday morning at Osage County EMS’s new ambulance station in Osage City. The American Heart Association describes cardiac arrest as the abrupt loss of heart function in a person who may or may not have diagnosed heart disease. The time and mode of death are unexpected and it occurs instantly or shortly after symptoms appear. Presenting the awards to all of the responders, Olson explained that around 350,000 people in the U.S. suffer from cardiac arrest each year, and the rate of survival is about 10 percent of those. 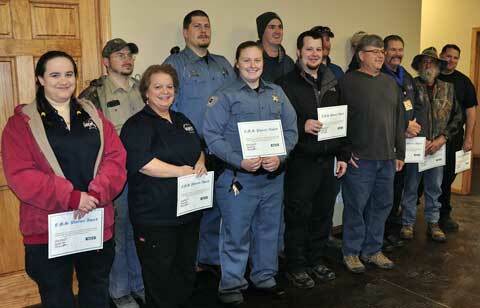 Donna Connell, Osage County EMS service director, noted that Osage County has maintained about a 17 percent survival rate, exceeding the national average, due to local responders’ quick response, excellent care and team work while trying to save peoples’ lives. Honored were: 911 dispatchers Mariah Schultz, Jenny Rogers and Brenda Smith; sheriff’s deputies Kayla McNary and Blake Reker; Osage County Fire District No. 1 volunteers Darrel Sinclair, Doug Eamigh, Dustin Bretsnyder, John Ryan and Mark Sinclair; and Osage County EMS personnel Ben McCaleb, Ted McDaniel and Cody Heckman. “Great work everyone!” Olson said. Osage County Sheriff Laurie Dunn and Osage County Commissioner Fred Diver were also present for the awards presentation. White offered his eternal gratitude to all who were involved in saving his life, previously describing them as a “band of angels” in a column he wrote about the incident. See On Windy Hill here.